Last week we had a blast at the Diane Modahl Sports Foundation (DMSF) graduation. The kids were here in full swing and there was lots of celebrating to be done – drums were banged (literally), grads got graduated, and the buzz could be felt throughout the whole office. It was a great chance to celebrate the work of the young people the foundation supports, and of everyone involved! As official charity sponsor of DMSF we’ve had an incredible journey so far, watching the amazing work that Diane and the rest of the team do, and watching those that the foundation supports flourish; and – as anyone who knows UKFast will know – we love to get stuck in too! Last Thursday we hosted a graduation event for 10 secondary schools across Manchester to recognise, celebrate and reward the achievements of ‘Team DMSF’ over the last academic year. 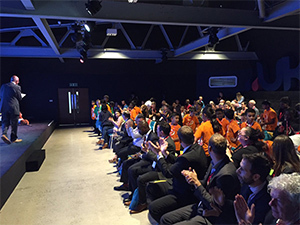 Inspirational speakers, Olympians and droves of young people took over our auditorium, making music, celebrating success and generally having a great time. Diane Modahl joined us on the day, and speakers included Barrister Tunde Okewale MBE, DMSF Ambassadors and Olympians Holly Lam-Moores and Bex Wilson, and Jonathan Bowers – Managing Director @ UKFast. Basically, absolutely loads of amazing people, committed to helping young people have the brightest future possible – a big thanks to everyone who got involved! It’s the second time we’ve had the pleasure of hosting the grad ceremony, which celebrates our young people’s achievements in the worlds of sport, education and life. It was great hearing how pupils and our participants have been able to transfer DMSF’s values into their everyday lives – values that are crucial to maintain once the young people graduate from the programme. We were also joined by the great and good from across the 14 Schools, Partnerships and Community programmes. These programmes are designed to give young people a sense of purpose, by raising aspirations, breaking down barriers and opening opportunities for them to find greatness – in other words ‘go out and conquer the world’ in sport, business and life! Our goal at UKFast is always to support and empower the potential of young superstars, and the foundation particularly works with disadvantaged areas, which we think is great too. We help them by offering up what we can, from venue space to career days, job opportunities, mentoring and – of course – website design and hosting. We love working with the foundation and it means a lot for us to be able to help. In return, it inspires our team and bolsters the community, encouraging the next generation of leading lights; Diane comes in and motivates our running club, and has delivered inspirational speeches to the entire UKFast team. We’ve spoken before about our CEO Lawrence being a big believer in the importance of staying fit, and many of the lessons from being at the top of your game athletically applies to succeeding in business too. Take a look at the amazing work our training and education team are doing.